Mary called into the MABS office to let the team know about the great experience she had with her service technician, Kyle, and how much she is placing on the system that we installed, and are maintaining for her. Watch the video to hear the actual call! When Curby bought his home in Clinton, IA, he was told the basement was already fixed. Yet, a year after they moved in the basement started to leak. When he called the Real Estate agent who sold him the property, he was told that was the way things were and nothing could be done about it. The leaks were small in the beginning so Curby and his family coped with the problem for a few years, until a very bad flooding episode, when they decided to look for help and chose MidAmerica Basement Systems for the job.Curby was very impressed with the entire experience, from the sales visit to the installation process. He is also very happy with the results. His basement has been so clean and dry, he now has plans to reclaim it as additional living space, building a game room and even moving his son's bedroom to the basement! The first Christmas that Jamie and Jason P. spent at their new home in Clinton, IA was spent mopping and using a shop-vac to pump water out of a flooding basement to prevent it from damaging their furnace. . Heavy storms had caused a lot of snow to accumulate around their foundation and as it melted, the water leaked into their basement. The wet, flood-prone basement was a huge problem for the family "It was always dark, wet, damp and we just needed more space so we called MidAmerica Basement Systems," explains Jason.Since they had the basement waterproofed by the company they have never had another leak or flooding episode. Their moping and shop-vacuuming the basement are over. " You have no idea until you do that a couple of times what a relief it is to not have to do that, or worry about it," concludes Jason. "I haven't had one piece of floor wet in my basement since you guys left. The sump pump is reliable, the quality of the work is beyond my expectations!" When Denise first purchased her home, she knew that she would want to someday finish her basement. After a few years of living in her home, she began to notice water seepages, putting her basement finishing project on hold. She knew that she couldn’t afford both basement waterproofing and basement finishing, so instead she left the basement unattended. When Denise heard of the WQAD Dry Basement Giveaway by MidAmerica Basement Systems, she thought she would give it a shot. Design specialist Joe Sarb, had inspected her situation and informed her on what she would need to do to fix her leaking basement. The day finally came when the winner was announced and Denise couldn’t believe it. She received a full perimeter drainage system, WaterGuard, and a TripleSafe sump pump. Denise also added CleanSpace Wall and a spray foam installation to help decrease humidity levels and increase the efficiency of the basement. She now has a dry basement that she can either leave the way it is, or finish it the way she would like. When Kathy and her husband first purchased their home, they never worried about a leaking basement, but over the years, water started seeping in and damaging their finished area. Water would come in all areas of the foundation, making the area unlivable. They reached out to MidAmerica Basement Systems because the previous homeowner had encapsulated the crawlspace. Design specialist, Joe, offered them a full basement waterproofing system with the option of Total Basement Finishing products to help complete and finish their basement. Project foreman Mike and his crew installed a WaterGuard and TripleSafe waterproofing system to ensure the basement will stay dry. EverLast Wall Panels and ThermalDry Flooring provided Kathy and her husband the relief of knowing that if for any reason the basement was to become wet or flood, the walls and flooring will not be damaged by moisture or mold. Kathy and her husband now have a basement the they can use forever without worry of moisture damage. Zach and Lindsey tried to sell their house last year, and during their inspection an issue with their foundation was discovered and the sale fell through. They knew they would have to get the problem fixed if they ever had any hope of selling their house. Luckily, that was the same time MidAmerica Basement Systems was running a foundation repair giveaway contest. As the lucky winners, Zach and Lindsey got the repair work they needed. They were able to sell their home this Spring! Pam S. has lived in the same house for 35 years, and over the course of all these years, she has dealt with water problems in the basement. She would often come home to a wet basement that she needed to mop and dry. Basement flooding is a common occurrence in the area where she lives, so she assumed that this was just the way things were supposed to be, and that her basement was beyond help. That was until she heard about MidAmerica Basement Systems and decided to call them for help. After the inspection and estimate, she chose to have a full perimeter WaterGuard internal drainage system installed and a powerful sump pump system, that includes a battery operated backup pump. Pam is particularly excited about this new sump pump system. With her old sump pump, every time she had a power outage, she found herself removing water out of her basement with buckets. The new sump pump system gives her the peace of mind of knowing that when the power goes out, the battery backup will kick in and keep her basement dry. With a dry, flood-protected basement Pam felt comfortable enough to reclaim her basement as usable space and had MidAmerica Basement Systems install ThermalDry tiles on the basement floor, and ZenWall insulated panels on the wall. Her basement now is dry, healthy, comfortable... and looks great, too! She was happy to invite her neighbors and show off her new basement! You don't have to live with a leaky, moldy or flooded basement in Illinois and Iowa. Call MidAmerica Basement Systems today for a free estimate! 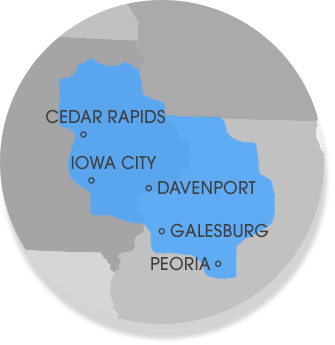 We proudly serve Quad Cities, Cedar Rapids, Peoria, Davenport and surrounding areas! Bob V. says he can't praise MidAmerica Basement Systems enough for the excellent job they did in his basement. His two main concerns were water intrusion and mold problems, and MidAmerica not only solved these issues, but they also helped Bob V. to reclaim his basement as additional living space, turning it into a beautiful, healthy family room! Bob was pleased with the entire process. The inspection was thorough, the sales process was informative and there were no pushy sales tactics. Bob got to see on the computer what his basement was going to look like once the job was finished. The crews that installed the systems were professional, punctual, and very respectful of the home and its inhabitants. A basement is an entire floor's worth of space that doesn't need to look and feel like a dungeon. With the help of certified professionals with the proper waterproofing and finishing materials, it can be transformed into any type of room you choose. In Illinois and Iowa, trust the experts at MidAmerica Basement Systems to deliver permanent solutions for all your wet basement problems, and basement finishing products that will last for many years! We serve Quad Cities, Cedar Rapids, Peoria, Davenport and surrounding areas! Stanley and Becky C.'s home had very leaky basement walls. Water was seeping through the concrete, soaking the carpet, and causing mold and odor problems. They looked at several options to waterproof their basement before opting for MidAmerica Basement Systems. According to Becky, MidAmerica was the company that had the perfect solution to their situation. Not only did they manage to stop the leaks with state-of-the art internal drainage technology and a powerful sump pump system, but they also took care of the walls and flooring, installing 100% waterproof wall panels and flooring tiles that are capable to withstand the harshest basement moisture conditions --even basement floods -- without getting ruined or moldy. They were impressed with the professionalism of the working crew, and how they performed the job without disrupting their home and yard, cleaning up after themselves each day. "You wouldn't even know they were here!," says Becky. The couple is also very happy with the fact that MidAmerica Basement Systems backs their waterproofing products with a transferable lifetime warranty. Their home is covered for as long as it stands, and if they sell the property, the future owner is covered too! These satisfied customers recommended MidAmerica Basement Systems to all their neighbors, friends, family, and area residents. If you live in Quad Cities, Cedar Rapids, Peoria, Davenport and surrounding areas, trust MidAmerica Basement Systems experts to fix your wet basement effectively and permanently. Call for a Free Estimate! http:/www.midamericabasementsystems.com | 1-800-378-2039 Bob H. and Lyn C. from Cedar Falls, IA called MidAmerica Basement Systems for help with their home's leaky basement.There was water seeping through a single corner, most of the time, but the existing drain was keeping it from pooling on the floor. During heavier rains however, a lot of water would leak in through the basement windows. Bob and Lyn would like to be able to use the basement while living in the home, but also have plans to sell the property in the near future,. For that reason they knew that the water intrusion issues would have to be dealt with sooner than later. In this video they talk about the experience they had with the company throughout the entire process, and the results after the job was completed. "The real question is: Is there anything we didn't like?" -- says Lyn. "And the answer would be No.If you want your basement to be dry, if you want your basement to look beautiful, if you want not to have to worry about leaving and going on vacation and having a flood -- because they have battery backups on their sump pumps. If you don't want to have to worry about your basement, have MidAmerica Basement Systems do your basements." MidAmerica Basement Systems is professional all the way. I am very impressed with the personals representing your company. Every company should have a "Kim." She was awesome. The crew was top notch. They did an excellent job for me. Mike was great. He made me fell at ease about my crack issue. The informational packet was excellent. I am very happy with the outcome of the work, the employees, and the company. I chose to do business with your company because of the lifetime warranty offered for your waterproofing system. The crew was very nice. The information I received was a nice packet to go over. It was helpful. Your company seemed better than any other that I met with. The system works good and have not had a problem since. You were recommended by my contractor, who spoke highly of your company. Eric did a good job of answering my questions and explaining the process. Job went very well! The crew was done earlier than expected. Crew picked up garage when they were done and even swept it. I can already smell the difference and I don't notice the damp smell anymore. Well worth the money I spent! Everything went smoothly. We even found a problem under the house that I didn't even know that I had. Your company was convenient to my home. Tim did a very good job with his presentation. I was very satisfied with the completed work. I was aware of the reputation of your company and of similar companies as well. I found yours to be the best. Everything went well with the job, had no problems and the guys went above and beyond for us. The representative was honest, which is a hard thing to find. The installation crew was on time to the minute. I selected MidAmerica to do this project because they were very willing to do such a difficult job and the price. It's nice to deal with a company who is reliable. As a widow, it is difficult to find some service people to trust. I heard about you guys on TV then your representative came out and did a nice presentation. That sold us on your system. The crew of men were great guys. They were more than courteous. Both guys were very good at explaining what they were doing. They are hard working boys and very good about clean up and keeping things organized. I picked your company because of the encapulation option, you returned my phone call first, and your service area covered Galena while other companies did not. Josh, the design specialist, was very thorough and detailed with information and recommendations for my crawlspace. The main reasons why we hired your company over any other company is because of your good representation, fast repair time (3 weeks), and your willing to travel. The installation crew was very polite, knowledgable, and considerate. Your sales representative explained the procedure in easy to understand terms. I liked your crew, your company, and employees. The crew were very polite explained everything they were doing and why. Extremly pleased with their work/Pete and Doug. They did a very good clean up. Our Design Specialist presented the company and product great. Everything he said was done. Great job by Ryan and Jordan. Could hardly tell the crew was even there. I thought the installation crew was courteous and communicated well amongst themselves and to me. The clean up job was well above what I expected to be done. I liked the plan the best from of all other bids and plans. Thanks!